Descriptions in this documentation may differ from or not be available in the Quick.Cms documentation. If you're using Quick.Cms.Ext v6.x, log in » to gain access to extended descriptions. This documentation was written for Quick.Cms.Ext! Descriptions in this documentation may differ from or not be available in the Quick.Cms documentation. Access to some sections is granted only to Quick.Cms.Ext v6.x users. Welcome, Quick.Cms.Ext user. In this section we described all options in our system, we divided them into parts. If this is your first contact with our program, start with first steps » instructions. To change your login data, assign pages to certain options, or other functions, use settings. Point to the icon in the top right corner of the administration panel and choose the Settings option. From the list choose a page, that a person visiting your website will see first. Of course it's logical that before setting this or other pages, you first have to create them, but you already know how to do that, you've read that in the first steps » instructions. From the list choose a page, on which search results will be listed. If you want to disable the search box, choose none. From the list choose a page, on which the map of your website will be shown. On the page you select, the software will automatically display all pages except for news type subpages, for example. You can disable the site map by selecting none, it's recommended for websites with a large amount of pages and subpages. Contact form will be assigned to this page. When a page that is being called does not exist, a user will be redirected to the page set in this field. Pages with a selected tag assigned to them will be listed on this page. Page with events This option is available after installing the newsExt plugin. Pages with events from a given date will be displayed on this page. Order form page This option is available after installing the ordering plugin. Select a page, to which the ordering functionality is to be assigned. Remember to add a widget with a order form to this page's full description. Order terms page This option is available after installing the ordering plugin. Settings for the page with ordering terms. After assigning such page, when a customer is placing an order, they will have to accept the terms. Registration page The option is available when the users plugin is installed. The link: user registration will redirect to this page. Profile page The option is available when the users plugin is installed. The link: user profile will redirect to this page. Page with register terms The option available after installing the users plugin. Page after logging in The option available after installing the users plugin. The page to which a user will be redirected right after logging in. Select page to which it is to be assigned, available for every customer, the list of his or her orders. Remember to add a widget with history of orders to the same page, to its full description. Enter your new valid email address if you want to change the login data. You don't have to fill this field in, if all you want to change is the password. Enter a new password you are going to use to log in to the administration panel. We recommend changing the password from time to time. To set a new email or a new password or both, you need to enter current email and password to confirm, that it's you and not somebody else trying to change the data. Try not to store your password on your computer. Don't use More » the remember password and email address option in your browser. This significantly diminishes your website's security. If you have to write the login data somewhere, use a piece of paper and put it away with your documents. Contrary to the popular belief it's a safer way than keeping it on your computer. Remember, that after making any changes in the form, you need to save it using the SAVE button at the top or bottom of the form. To go to the list of pages click Pages on the top menu bar under the OpenSolution logo (on the left). Name - page name. Click on a chosen page name to edit the page. You can manage pages by changing their status (display) or position respective to other pages. Remember, that after changing these data you need to save them by clicking the orange save button on top or bottom of the list. Sorting pages - click one of the fields on top of the list: Id, Name or Position to sort the list by the chosen field. View pages on a separate list - if the icon is found next to the page name it means, that its subpages are available on a separate list. Click the icon to go to the list of subpages of selected parent page. To go the a page edit form you need to click the page name or the icon. It's the name of the page you're editing, it will be displayed in a menu or in a list or subpages as well as the page title. You can More »change the page name displayed in a menu if, for example, it's too long. In the Advanced tab set the Name in a menu. It's the text that will be displayed on the list of subpages. It's the page content. 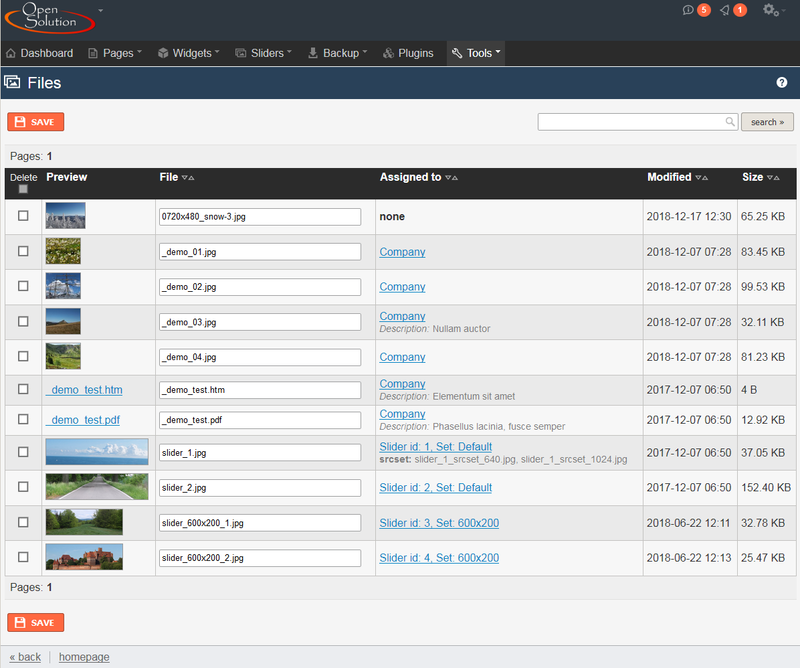 The built in editor allows you to add many elements such as lists, images, links, galleries, widgets, etc. To add a chosen gallery or a widget (custom type) to the page content, click the or icon, then from the list select the element you want to add. If there's too much content on a page and you want to use text Pagination, click the icon to divide the content into several pages. Used to display less used fields on the form. Fields activated by this option can be defined in the variable: $config['page_form_fields_hide']. In some cases these fields will not be hidden - for example if they are filled in. When a new product is added, price fields will also be displayed without any additional actions. Price of a product. If you want a price to be displayed on the list of pages and in page details, enter a numeric value here. Remember, that in order to have a price shown on the list, on the parent page you need to set in the "Additional parameters" the price to be displayed in the page elements or on the list. You can assign the page you are adding/editing to another page, the page you're adding/editing will be displayed on the list of subpages of that another page. If you don't want your page to be a subpage, choose the option none, and then set a menu in which it will be displayed. Determines position of the page in a menu, list of subpages, etc. Pages with lesser position are displayed before pages with higher position. Negative values are allowed to help you manage this field when a website has many pages. Determines which menu the edited page will be assigned to. This field will be hidden if a page is selected from the list of parent pages. From the list choose the way subpages assigned to this page will be displayed. News - subpages of a given page will be displayed as news including name, date (if given), short description and image. The news will be sorted by date oldest to latest and will not be included in the Site map. Gallery - subpages will be displayed as an image gallery in three columns. Slider - subpages will be displayed in a slider. Products - subpages will be displayed as product catalog in three columns. If you want to control the elements displayed on specific lists, familiarize yourself with the description of the $config['default_pages_list_config_type_x'] variable. When a full address is entered in this field, a person visiting the page will be redirected to that address. You can redirect to external websites or to pages on your website. This option is displayed after clicking the Show button next to the drop down list Redirect to URL. Using this function is recommended when you want the page you're editing to redirect to another page within your website. first one is using the built into a browser calendar. It is easy to use and a protects from entering the wrong date format. second is less visually friendly, but allows for more and is well known from previous versions, the date is given together with hour and minute. Allows to display less used fields on the form. Fields activated by this option can be defined in the variable: $config['page_form_fields_hide']. In some cases these fields will be visible from the start - for example if they are filled in. When a new product is added, price fields will also be displayed without any additional actions. The fields below will be visible only after activating them by clicking on "Display fields" in the select. The field is responsible for displaying the "Got a question?" link redirecting to the contact form. After selecting this option it will be possible to order the edited page. Checking this option causes displaying client-side date and name of the administrator who made the last modification of the page. From the list of sliders select the one you want to be displayed as a main slider. You can also disable displaying of the slider on the edited page after selecting the option none. Otherwise the slider set as default will be displayed. Enter an alternative name that will be displayed in a menu. Usually this function is used when the page name in the Name field is too long. Field used by the script's search tool. Enter here all phrases not included in the name, short and full description as well as in SEO fields. Selecting this option will make this page also appear on a separate list "Products" (drop-down position in the "Pages" menu) in the admin panel. For such pages the "Price" field is displayed in the first tab "Content". All files on this page will be displayed in a table with additional information and sorting ability. If the page has subpages, when this option is checked they will be displayed in a drop-down menu after pointing to the page. Event from Option available after installing the newsExt plugin. first is the browser built in date handling with a calendar. It helps to handle the date and protects against typing in an invalid date. the second one is less visually friendly, but leaves you more possibilities and is familiar from previous versions, the date must be given with hour and minute. Event to Option available after installing the newsExt plugin. Subpages in the calendar Option available after installing the newsExt plugin. If this option is selected, subpages of second level will be displayed in a widget with selected calendar option. User group Option available after installing the users plugin. You can assign pages to selected user groups. Name, that will be displayed in the top bar of your browser, as well as page title used by Google search engine. Name to be displayed in the address field of the internet browser. Use this field when there are two pages with the same title on the website. This address is also used by Google search engine. This field contains short description of a website visible only to browsers and used only by them. If this field is empty, the script will generate the description, but if there's the need, the meta description may be set manually. From the list select the position you want to use. You can, for example, make the website your editing not to be indexed by Google. Select tags to which the page is linked and which will be displayed client-side under page's full description. After selecting a tag, all pages with the tag will be displayed. Click on the "New tag" link to display a new tag form in a new browser window. Fill it following the instruction » and save the tag. Then close the tag window, save the page and you should see the newly added tag. Check this field if you want the edited page ID to be included in the link. After choosing this option, the page you are editing will not be included in search results when using a search tool on your website (if you use it). Choose this option for purely "functional" pages, such as register or order form. To add files, click the Select files from computer to upload button, then select files you want to put on the edited page. After uploading them, save the page (click the save button), so that the selected files are attached to the page. If you want to add more than one file, hold the Ctrl key and select other files. If there are too many files, not all of them will be displayed. You will see however a Show all files buttons, which you have to click on More »to see all files on the server. If you know the name of the file, use the search box in the File column. Description - displayed under the file and in the ALT attribute, if the "Alternative description" field is empty. More »In case of images, if the $config['link_images_to_url_from_description'] » variable is enabled, you can enter in this field an URL address starting with "http", for example http://www.google.com. When a visitor clicks on a thumbnail in page details, he or she will be redirected to www.google.com. It's useful, when a thumbnail is, for example, a manufacturer's logo, which is supposed to redirect to their website. Remember, that if you want to show the URL address in the image description but you don't want it to redirect to the website, remove the "http://" from that address. For example, replace "http://www.google.com" with "www.google.com". Alternate description - for images only - separate description for the ALT attribute, very important for web search engines. Location: page details - for images only - location in which the image will be displayed in page details. Page details - size of a thumbnail that will be used in page details. On the right, next to the image size field, you can also set the full size image option. Unchecking this option will block the possibility to click on the thumbnail in page details to see the full size image. This solution is useful when thumbnails displayed in page details are large and there's no need to present bigger versions. List of subpages - size of a thumbnail displayed on the list of subpages, when a parent page is assigned to the page. First check the field, you will see a select of various thumbnail sizes, as well as an "x" button, click on it to cancel this option. Widgets, etc. - size of a thumbnail displayed in locations other than already mentioned, for example in widgets. First check the , then you will see a select of various thumbnail sizes, as well as an "x" button, click on it to cancel this option. This tab displays files attached to the page that is being edited/created and allows to delete them. Position - order in which files will be listed if there are many. Negative values are allowed. Description - displayed under the file and in the ALT attribute, if the "Alternative description" field is empty. More »For images, if the $config['link_images_to_url_from_description'] » variable is enabled, you can enter in this field an URL address starting with "http" for example http://www.google.com. Then when a visitor clicks on a thumbnail in page details, he or she will be redirected to www.google.com. It's useful, when a thumbnail is, for example, a manufacturer's logo, which is supposed to redirect to their website. Remember, that if you want to show the URL address in the image description but you don't want it to redirect to the website, remove the "http://" from that address. For example, replace "http://www.google.com" with "www.google.com". Alternate description - for images only - description for the ALT attribute, very important for web search engines. Choose the template that will be displayed after entering the page you're editing. Choosing this option will hide the list of subpages of the edited parent page on the main list of pages in the administration panel. On the list next to the parent page there will be a "+" icon, redirecting to the list of subpages of selected parent page. This form element can be unavailable to you when a developer mode is enabled and the $config['disable_additional_params_editing'] variable is set to true. Options available here require advanced knowledge. Modifications of entered values can cause the page to display incorrectly in its menu. Use these options carefully. In the Graphics design - advanced information » section we have described in detail how to use additional parameters. In this tab you can enter features, for example product's technical specifications. If you're using the advanced search tool (advancedSearch plugin) with feature search, enter values in to the same format. For example, if you type in weight 10 kg, always use the same format: 10 kg. There are other formats, such as: 10kg, 10 kilograms, 10.00 kg, 10 000 grams, etc. This makes it necessary to standardize feature descriptions which will be displayed in the search box. When adding a feature (menu Pages -> New feature), it's possible to define possible values, which you can later choose here when editing a page. After clicking the "New feature" option you will see two fields. In the first of those two enter the feature's name, such as weight, in the other the feature's value (technical specifications), for example 10 kg. This tab allows to select linked pages, which will be displayed client-side under page's full description. Select pages to be related to the given page. You can select multiple pages by clicking them while holding down the CTRL key. After selecting this option, the list of related pages will be displayed as a slider instead of a classic list. After clicking on it, you will be redirected to the list to see which pages are linked to edited page. After changing any data in the save, remember to save the data using the SAVE button on top or bottom of the form. save and clone - this save option will save changes on the edited page and will create another one with identical content Option available after installing the clonePages plugin. save with the setting - after clicking on the button the page will be saved as well as initial settings of many options such as status, type of list of subpages, hiding pages in sitemap. Each next added page's initial settings will be the same as the last page saved using this button. Point to the "Pages" tab and select the Export to CSV link. Save the downloaded file on a disc and open it in any editor such as Notebook. Note! This functionality is only available with the exportImportPages plugin which needs to be installed. If you don't see this position on the menu, the plugin probably hasn't been installed. The functionality allows to export pages to a clear CSV format, and later to import them to the script. Each page is recorded in a separate line, fields of which are separated by the "$" separator. Descriptions of all data are displayed in the first line of a file. Page data can me modified. Remember to keep proper data format (for example position must have a numeric value), as well as order of columns, and to use the "$" character only as data (fields) separator. File - select a file from the disc with modified page data. Before importing pages we recommend backing up the database as described in the list of backups » section. Each operation should be finished with saving the data by, for example, the "upload file" button on top or bottom of the form. After starting the OpenOffice.org Calc program select "File" in the top menu and then "Open". 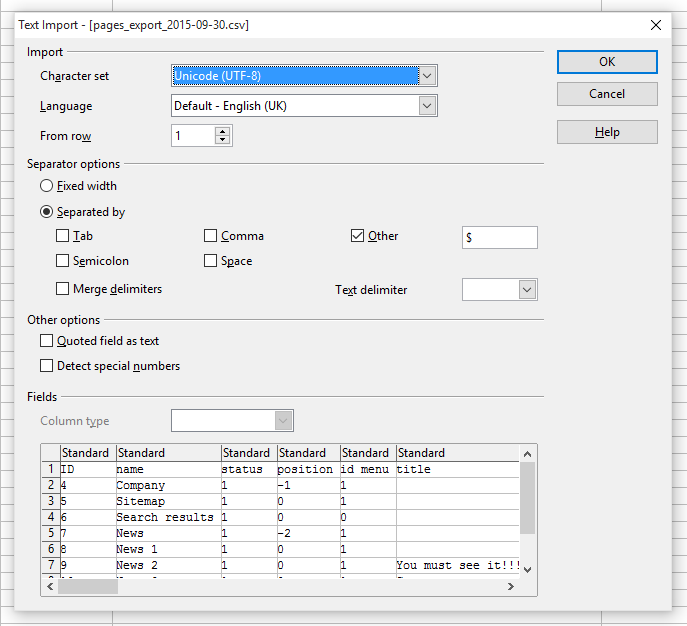 Select a file from disc with the CSV exported data. When the changes are made, you can save the data selecting "File" and then "Save" from the menu. You will see a message asking about the format the data should be saved in. Choose the CSV format. To go to the list of features point to the Pages button on the top menu bar of the administration panel, under the OpenSolution logo (on the left), and then click the Products link. Note! This functionality is only available with the pagesProducts plugin, which requires installation. If you don't see this position on the menu, the plugin probably hasn't been installed. Parent page - name of pages, to which the page on the list is assigned to. If you click on the name of a parent page, you will be redirected to its page form. Price - product price. You can change its value while viewing the list of products. You can manage product pages while viewing their list by changing their status (visibility), price or position relative to other pages. Remember, that after changing these data you need to save them by clicking the orange SAVE button on top or bottom of the list. Sorting pages - click one of the fields on top of the list: Id, Name, Price or Position to sort the list by the chosen field. This option basically redirects to a page form. It is possible to adjust the form's layout in such a way, that adding (editing) products is more effective. In the standard version, the price field, for example, is available for a product without activating it with "Display fields". The same way the "Product" field in the "Options" tab is displayed without taking any actions and it is checked. To find out more about displaying and hiding fields using the "Display fields" option go to the description of the $config['page_form_fields_hide'] variable. Notice! This functionality is available along with the pagesProducts plugin, which requires installation. If you don't have this item on your menu, this plugin probably isn't installed. 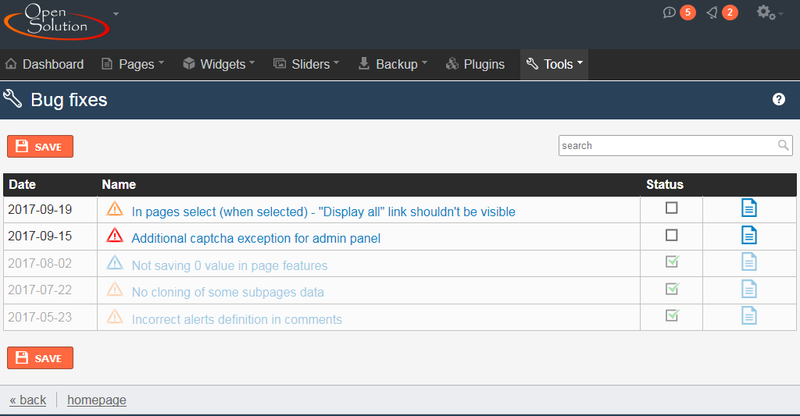 To go to the list of features point to the Pages button on the top menu bar of the administration panel, under the OpenSolution logo (on the left), and then click the Features link. Note! This functionality is only available with the pagesFeatures plugin, which requires installation. If you don't see this position on the menu, the plugin probably hasn't been installed. Pages with the feature - number of all pages using given feature. Clicking on the number will redirect the user to the list of page, that use the selected feature in their description. To add a new feature to a page point to the Pages tab and then click the New feature button. Select option - marking it allows you to define a list of values available for selection in page form. Click the "New value" button to add new elements to the list. Click on the Find pages with features link available in page form, then you will be redirected to the list of pages that use the edited feature in their description. After making changes to the form's content remember to save the data using the SAVE button, located on top and bottom of the form. To go to the list of widgets click Widgets on the top menu bar in the administration panel under the OpenSolution logo (on the left). Name - widget name. Click the chosen widget's name to edit the widget. Location (used in pages) - specifies where a given widget is to be displayed. Digits displayed in the circle inform about the number of subpages, in which they are displayed. They also allow to display these subpages. Display date range - date range within which the widget is to be aired. Option available after installing the widgetsExt plugin. Information displayed in a graphic form next to the widget's name. Display method - determines which elements are to be displayed (page data, custom content, menu, etc.). You can manage widgets on the list changing their status (visible or not) or position relative to other widgets. Remember, that after changing these data, you have to save it by clicking the save button located on top and bottom of the list. Widget sort options - click one of the fields on top of the list: Id, Name, Position, Localization or Display option to have the list of widgets sorted by the selected field. Widget search box - above the list there is a search box to help you find the widgets you're looking for. Click the widget name or the icon to go to the widget edit form. Determines where the widget is to be displayed. Choosing the Custom option is usually used when the widget is to be placed inside a page content. Display Option available after installing the users plugin. Determines user group that is granted access to the widget. All - it will be displayed to all users visiting the website. Option available after installing the users plugin. Logged in - it will be displayed only to logged in users. Option available after installing the users plugin. Not logged in - it will be displayed only to users who are not logged in. Option available after installing the users plugin. Determines order in which widgets are displayed with respect to other widgets. The widgets are ordered from the smallest to the greatest value. Negative values are allowed. If this option is selected, widget will be visible. Typing in a date according to specified format will make the widget be displayed only from that date. Depending on settings the script allows to use two date formats. first one is using calendar built into a browser. It is easy to use and a protects from entering the wrong date format. Typing in a date according to specified format will make the widget to be displayed until the given date. Depending on settings the script allows to use two date formats. Specific pages - the widget will be displayed only on specified pages. Widgets will be displayed also on subpages of pages selected in the field above. This form element can be unavailable to you when a developer mode is enabled and the $config['disable_additional_params_editing'] variable is set to true. Options available here require advanced knowledge. Modifications of entered values can cause widgets to display incorrectly. Use these options carefully. In the Graphics design - advanced information » section we have described in detail how to use additional parameters. To go to the slider list click Sliders on the top menu bar in the administration panel under the OpenSolution logo (on the left). On the list of sliders you can do many operations including managing sliders. An example of the list is shown below. Set - name of the set to which the slider is assigned. After installing the slidersSets plugin it can link to a set edit form. You can manage sliders in the list by changing their status (visibility) or position in relation to other sliders. Remember to save data every time you make any changes to these data by clicking the orange save button on top or bottom of the list. To go to the slider edit form you need to click the slider name or the icon. Image - image that will be displayed in the slider. When adding a new slider in the version 6.5, you can select an image from your computer or from already added sliders on the server. Since version 6.5 it's also possible to change a slider image to a different one assigned to previously added sliders. Set - enter set name in which the slider is to be in. You can also assign the slider to previously created sets. Redirect to URL - this field may contain an address to which a user will be redirected after clicking the chosen slide. After clicking the more button, the list of pages on the website, to which a user can be redirected is displayed. Alternate description - this field is available if an image is attached to the slider - description for the ALT attribute, very important for web search engines. Options available here require more advanced knowledge. Modifying their values could cause the slide to display incorrectly. Please be careful when using these options. In the Graphics design - advanced information » section we have described in detail how to use additional parameters. 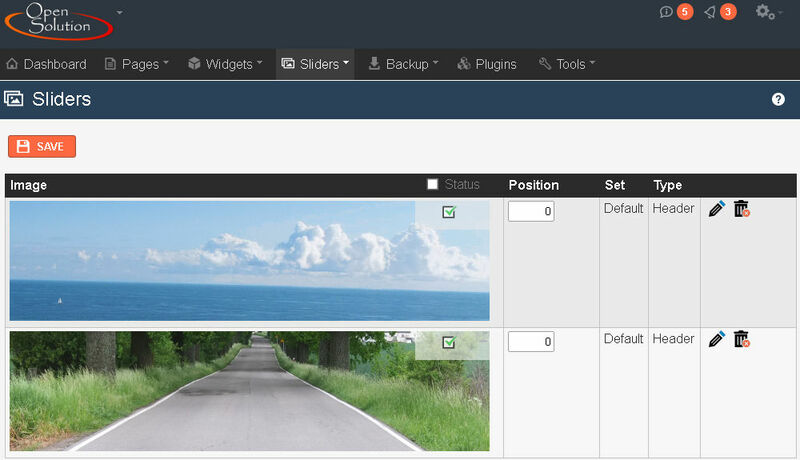 To go to the list of slider sets point to the Sliders button on the top menu bar in the admin panel under the OpenSolution logo (on the left), and then click on the Slider sets link. Type (used on pages) - it is the slider set type (images assigned to it, to be precise). Default slider types are: "Widgets" and "Header". Numbers displayed in a circle inform about the number of pages in which a given set is shown. They also allow to see these pages (when you point to them). Sort sets - click on one of the fields at the top of the list: Id, Set or Type, to see the list sorted by the chosen field. To go to a slider set edit form, click the set's name or the icon. Type (used on pages) - it is a slider set type (images assigned to it, to be precise). Default slider types are: "Widgets" and "Header". Numbers displayed in a circle inform about the number of pages in which a given set is shown. They also allow to see these pages (when you point to them). Options available here require advanced knowledge. Modifications of entered values can cause the sliders to display incorrectly in its menu. Use these options cautiously. In the Graphics design - advanced information » section we have described in detail how to use additional parameters. In this tab you can select pages, you want the set to be displayed on. If you select all - the slider set will be visible on all pages. You also select single pages, then the set will be displayed on selected pages only. To go to the list of backups click Backup on the top menu bar in the administration panel under the OpenSolution logo (on the left). Restore data - over the list there is another one, from that list you can choose which data will be restored, when you click the icon. To go to the list of plugins click Plugins on the top menu bar in the administration panel under the OpenSolution logo (on the left). To install plugins, on the left side of the table put a check mark next to the plugins you want to install. Then click the install button, you will see a window with an plugin installation progress bar. To get to the list of languages point to the Tools button on the top menu bar in the administration panel under the OpenSolution logo (on the left), then click the languages link. To go to a language edit form, click the language name or the icon. In this tab translations relevant for both client and administrator are available. This tab contains translation used in the administration panel only. This tab contains translations used as email templates sent by the system, for example notifications about a new comment added on a website. You can use additional options (variables) here. For example, using [PAGE_NAME] in the email content, will insert information about name of the website on which the comment was placed. When there are more than one language in the script, additional translations from the main language set in script's configuration will be displayed when one of the languages is edited. To add a new language point to the Tools tab and click the new language link. Clone data from basic language - check this option if you want to copy all data from the basic language database (pages, widgets, sliders). More »If your website has hundreds of pages or files, contact your webmaster to do this for you. You should do the cloning on a local server, but first in the PHP configuration file (php.ini) set the max_execution_time option to, for example, 180. If you encounter more problems moving the data, restore a backup and increase the execution time limit. After adding a new language, click the link representing its name on the right side of the top menu in the admin panel. Then go to settings » to set the new start page, search results page, etc. for the new language. To go to the list of bug fixes point to the Tools tab on the top menu bar under the OpenSolution logo (on the left) in the administration panel, and then click the bug fixes link. Status - bug status (corrected or not). You have to mark this field yourself if you know, that you've implemented the bug-fix and the system is not able to verify it automatically. After marking this field, remember to click "SAVE". To go to the list of comments point to the Pages button on the bar in the top menu in the administration panel below OpenSolution logo (on the left), and then click the Comments link. Note! This functionality is available only with the comments plugin, which requires installation. If you don't have this option on the menu, it probably means that the plugin was not installed. Widget - placing a comment in the pool of comments randomly displayed in a widget Option available after installing the commentsExt plugin. You can manage comments from the list by changing their status (visibility). Remember to save the data after making changes, by clicking on the orange save button on top or bottom of the list. Search comments - above the list there is a search box allowing to filter comments by a phrase, as well as sbupages to which those comments were added. To get to the list of subscribers' emails point to the Tools button on the top menu bar in the administration panel under the OpenSolution logo (on the left), and then click the Subscription link. Note! This functionality is available only with the newsletterLiteExt plugin, for which installation is required. If you don't have this option on the menu, it probably means that the plugin was not installed. E-mail addresses can be exported to a file by clicking the Download the list link. The addresses can be then imported to a website which provides services of mass email sending, for example mailchimp.com. To go to the redirections list point to the Tools button on the top menu bar in the administration panel under the OpenSolution logo (on the left), and then click the List of redirections link. Note! This functionality is available only with the seoOptions plugin, for which installation is required. If you don't have this option on the menu, it probably means that the plugin is not installed. To go to the list of polls point to the Tools button on the top menu bar in the admin panel under the OpenSolution logo (on the left) and then click the Polls link. Note! This functionality is available only with the polls plugin, for which installation is required. If you don't have this option on the menu, it probably means that the plugin is not installed. To add a new poll point to the Tools tab and then click the New poll link. Votes - number of votes submitted for specific answers. The values are displayed when a poll is edited. All votes - number of all votes submitted. The value is displayed when a poll is edited. To go to the list of files on the server, point to the Tools button on the top menu bar in the admin panel under the OpenSolution logo (on the left), then click the Files link. Note! This functionality is available only with the filesManagerExt plugin, for which installation is required. If you don't have this option on the menu, it probably means that the plugin is not installed. Assigned to - informs to which page or slider a given file is assigned. Click the page or slider name to go to its edit form. Below there is an image description within a page. In case of sliders, additional information about files for responsive versions (srcset) generated for a given slider can be displayed. Sorting files - click one of the fields on the top of the list: File, Assigned to, Modified or Size to sort the list by the chosen field. Sorting by "Assigned to" is not all that typical, because it not mostly used to sort by the assigned name. It allows to display the files which are not assigned to any page or slider first, and those which are, are sorted by file name. Delete files - tick files on the list you want to delete, then click the save button to confirm. Change file names - in the File columns change the existing name to another one. To go to the list of tags point to the Tools button on the top menu bar in the admin panel, under the OpenSolution logo (on the left), then click the Tags link. Note! This functionality is available only with the tags plugin, for which installation is required. If you don't have this option on the menu, it probably means that the plugin is not installed. To add a new tag to a page, point to the Pages tab and then click the New tag link. Clicking on the Find pages with the tag link available when editing a tag, redirects to the list of pages assigned to the edited tag. To go to the list of administrators point to the Tools button on the top menu bar under the OpenSolution logo (on the left), and then click the Administrators link. Note! This functionality is available only with the admins plugin, which requires installation. If you don't have this option on the menu, it probably means that the plugin was not installed. To add a new administrator point to the Tools tab and click the New administrator button. This tab allows to set right for a new admin for specific sections in the admin panel. For example, selecting the "Sliders" field means, that the admin will be able to manage sliders. Marking the "Backup" field means, that the admin will be able to view and restore backups, etc. Some in sections permission rights can be assigned in a more complex manner. You can give an admin rights to edit, add or delete separately. This means that an admin can either have full rights to manage widgets, or just to edit them. 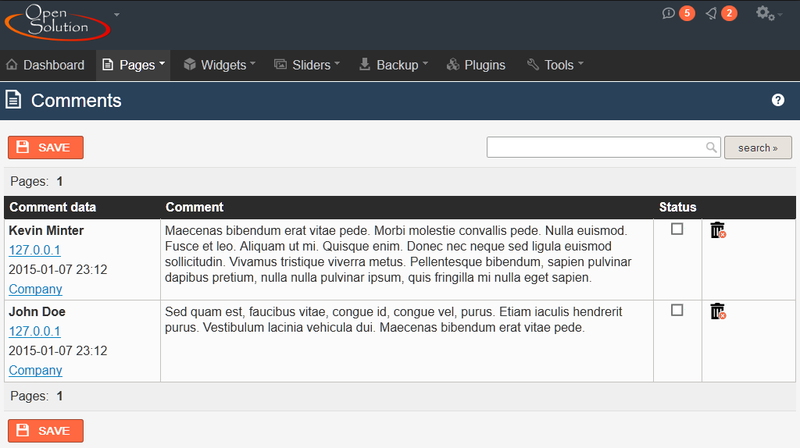 After installing some plugins, additional sections will appear, such as: comments, subscription, users etc. Most of them has basic access rights set, that is only for the whole section, without the above division. It means that the administrator can also delete pages he or she has access to. Remember, that after making any changes in the form, you need to save the data using the SAVE button on top and bottom of the form. To go to the list of page statistics click the Tools button on the top menu bar in the administrations panel under the OpenSolution logo (on the left), and then click the Page statistics link. Note! This functionality is available only with the stats plugin, for which installation is required. If you don't have this option on the menu, it probably means that the plugin is not installed. Clear statistics - possibility to clear statistics. In order to improve performance we recommend clearing statistics from time to time. Date from - date from which statistics of pages viewed on the website are counted. Date to - date to which statistics of pages viewed on the website are counted. Search - searches statistics within specified date range. To go to the list of searched phrases click the Tools button on the top menu bar in the administrations panel under the OpenSolution logo (on the left), and then click the Searched phrases link. Date from - date from which statistics of searched phrase on the website are counted. Date to - date to which statistics of searched phrase on the website are counted. To go to the list of file download statistics click the Tools button on the top menu bar in the administration panel under the OpenSolution logo (on the left), and then click the File statistics link. Date from - date from which statistics of file downloads on the website are counted. Date to - date to which statistics of file downloads on the website are counted. To go to the list of calls of incorrect addresses click the Tools button on the top menu bar in the administration panel under the OpenSolution logo (on the left), and then click the Incorrect calls link. Date from - date from which statistics of incorrect link calls on the website are counted. Date to - date to which statistics of incorrect link calls on the website are counted. To go to the list of users click the Users button on the top menu bar in the administration panel under the OpenSolution logo (on the left). Note! This functionality is available only with the users plugin, which requires installation. If you don't have this option on the menu, it probably means that the plugin was not installed. Name - user's last and first name. If the "ordering" plugin is installed, then number of placed orders is shown next to the user name. Sort users - click one of the fields on top of the list: Id, Name, Company or Status to see the list sorted by the chosen field. Search users - above the list there is a search box you can use to find the user you need. To add a new user to a website point to the Users tab, and then click the New user button. In this field an administrator can save a comment regarding the user. This field is only visible to the administrator. save and go to the list - this save option will save the changes made to the edited user and redirect to the list of users. save and add another - this save option will save the changes made to the edited user and redirect to an empty new user form. To go to the list of user groups point to the Users button on the top menu bar in the administration panel under the OpenSolution logo (on the left), and then click the Groups link. Note! This functionality is available with the users plugin, which must be installed first. If you don't see this position in the menu, the plugin is probably not installed. Search for groups - above the list there is a search box that will help you find the user group you're looking for. To add a new user group to a page point to the Users tab and then click the New group button. save and go to the list - this save option will save the changes you made in the user group you're editing and redirect you to the list of groups. save and add another - this save option will save the changes you made in the user group you're editing and redirect you to an empty form so you can add a new group. To go to user login history point to the Users tab and then click on the Login history button. Notice! This functionality is available with the users plugin, which must be installed. If you don't see this menu item, probably this plugin hasn't been installed. Name - user's last and first name. "none" means that a user tried to log in into an account that doesn't exist on the website. Sorting login history - click on one of the fields on top of the list: Email, Login, Date, IP, Status, and the list will be sorted by the chosen field. Search - above the list there is a search box, which will help you find events that interest you easier. To go to the list of notices, point to the Tools button on the main menu bar in the administration panel under the OpenSolution logo (on the left), then click the Notices in forms link. Notice! This functionality is available with the noticesAccepts plugin, which needs to be installed. If you don't have this position in the menu, the plugin probably hasn't been installed. Notice search box - above the list there is a search box, that will make it easier to find a notice you're looking for if there are a lot of them. To add a new notice to a form, point to the Tools tab, and then click the New notice button. After making changes to a form's data, remember to save the data using the SAVE button, on top or bottom of the form. save and go to the list - this save option will save the changes made to the edited notice and redirect to the list of notices. save and add another - this save option will save the changes made to the edited notice and redirect to an empty new notice form. To go to the orders list, click the Orders button on the bar in the top menu in the administration panel, which is located under the OpenSolution logo (on the left). Note! This functionality is only available with the ordering plugin which needs to be installed. If you don't see this position on the menu, the plugin probably hasn't been installed. Order search box - above the list there is a search box which will help you find a specific order faster and easier. To go to the order view (edit form), click its status, value or the icon. Status of the order. Any status from the list in the next field over can be entered ($config['order_status_types'] » variable). Comment added by a purchaser while placing the order. In this field the administrator can enter notes concerning the order. This field is visible only to the administrator. This tab contains the list of products ordered by a customer. It also allows to edit them and add new positions. Under the list of products there is the entire order's Value. Below it there's the button which allows to add more items to the order. New positions added to the order by an administrator have no Id on the list. This way you can distinguish between products ordered by a customer and the ones added later on. This tab is only available after installing the orderStatusInfo plugin. Allows to send email notifications for customers about status changes. Individual content can be configured here. Field with the text used as content of an email informing about status change. Here you can use additional options (variables). For example put [ORDER_ID] in an email title to have an order id this email is regarding in the title. Remember, that changes made in this tab are not saved. They will apply only to the specific form you're currently working on. This means that if you change the email's title and send it to a customer, the next time you use the form, the default content from the language variable will be loaded. To go to the history of changes point to the Pages button on the top menu bar in the administration panel under the OpenSolution logo (on the left), and then click on the History of modifications link. Note! This functionality is available with the pagesLogs plugin, which requires installation. If you don't see this position in your menu, the plugin was probably not installed. You will see the history of modifications of subpages made by each of the admins. Admin's data - admin's name. Name of the main administrator and web developer can be set in the language edit form » in Developer_admin and Main_admin fields. Filtering results - above the list there are options: Date from, Date to, Admins and Pages. They allow to browse through the history of changes by various parameters.